When in 2005 Pat Metheny Group released The Way Up, a monumental almost 70-minutes suite made of 4 tracks crossing so many genres that would be hardly filed only in the jazz label, it became an instant success and a recording appearing in most of the best-of-the-year lists. Summoning one of the best creative and pushing forward moments of the long-living band, it resulted a redefining footstep of how an unexpected epic narrative could be developed by a jazz artist. Looking back at the past, I personally felt like a bridge was made between my jazz and progressive rock listenings: lately I realized this held a clue of how differently this sense of narrativity is embraced by artists belonging to an area and to another. What would have seemed a dismaying mountain to climb for any jazz artist -not to mention the implict risk of jeopardizing any improvisation attitude when navigating such complexes arrays of ostinatos and counterpoints- was instead not frightening for drummer Antonio Sanchez. The fellow member of Pat Metheny Group revived that narrativity and that same momentous articulated style of composition with his Migration band, now hailing another overcomplex recording of extended duration, entitled Lines in the Sand. Yet, what is more striking about this recording, putting a mark of difference between what came before, is the need to tell a contemporary story. The story is happening now, the story is in front of our eyes every day in the news. It’s the story of the immigrants facing desperation on the southern border of US. Antonio Sanchez goes back to that same narrativity as in The Way Up to tell this story. At same time as Lines in the Sand is released, its story unfolds under our eyes. The caravan of central american immigrants has reached the american border and tries to force the border to enter US, being rejected with violent reaction. Immigrants cruellest mistreatments are causing a stirring in US public opinion. I am a proud immigrant. A proud Mexican and a proud American, says Antonio Sanchez in the booklet of the new recording released under the production of his usual collaborator Ermanno Bassi for CamJazz. The drummer holds no mystery indicating that making a choice between boundaries is a deplorable and mischievously political calculation fed by that the US president he publicly opposes since the very start. When the adventurous solo drum and samples effort Bad Hombre was released in 2017, an angry and inquisitive Antonio Sanchez was pictured on the cover over a black frame. The reference was at bad hombres, the shameful title the US president called the Mexicans with. Lines in the Sand draws a picture of a red-dressed lady on the side a gigantic wall falling at sea, holding the borders well closed. What feels like a dystopian, special effects reframed picture, it is instead becoming reality. Antonio Sanchez has extensively toured in the last three years with the Migration band: after releasing the eponymous record, the Migration band became more a long term project. The Meridian Suite, released in 2015 at the name of Antonio Sanchez & Migration, included for the first time an extended suite. This time no jazz elders were functioning as guests. It was the sign the drummer was revealing his vision, a precise direction in how composing and improvising could interact into this overcomplex net, and he was ready to develop it with his own line-up. While improvisation is not at any reason secondary in this project, it still plays a different role than any standard jazz session. Even though developed through a very precise framework -i.e. the live duration of the suite did not extend or reduce during the live session- still it holds an unwritten set of rules on where to release or restrict space of improvisation. The Migration band line-up has been quite stable through the two recordings, with the only Chase Baird at saxophones and EWI being the new member. Singer Thana Alexa, being the most evident link with the ’80s Pat Metheny Group sound, is cleverly moving between leads and counterpointing the rhythmic lines, at times in unison with Baird, who is mainly focused on the rhythmic side. Matt Brewer is now becoming a long standing collaborator with Sanchez, and he always adds the most flexible palette to the virtuoso polyrhythmic patterns developed by the drummer. And finally John Escreet, who is one of the most surprising and impossible to anticipate musicians around -his latest solo release Learn to Live shows how easily he can depict funk, contemporary jazz, fusion and so on- and always shows unpredictable solutions through his playing. When drummer Antonio Sanchez moved in New York in 1993, he soon became an established side man with the types of Chick Corea, Gary Burton, Michael Brecker, Danilo Perez, in addition to the afore mentioned Pat Metheny. The legenday guitarist often praises the drummer’s key role in his playing -he joined and continue to join multiple Metheny projects since- mentioning his orchestral skills. Those of course played a key role in the development of late PMG’s projects as well as his solo projects. Still he started his solo career with Migration, released with what has been his main producer since, CamJazz. While moving seamlessly through the collaborations of many of the established jazz players -take the wide range of trios playing in Three Times Three-, he is now on the verge of pushing new unseen boundaries with his own vision. Following his acclaimed grammy for the only-drum iconic Birdman movie soundtrack, he put that to an interesting drum plus movie tour and then explored drum solo again with the mentioned Bad Hombre. Finally he turned back to the other end of the spectrum for an orchestral work. Earlier this year he published Channels of Energy together with Vince Mendoza and the WDR Big Band putting the complex architecture of his tracks even more at risk like a trapeze artist on the rope in a live fueled and bombastic energetic releasing effort. While Lines in the Sand is still impressed by this same orchestral mark, the difference stands in how he develops a sense of narrativity through his writing. 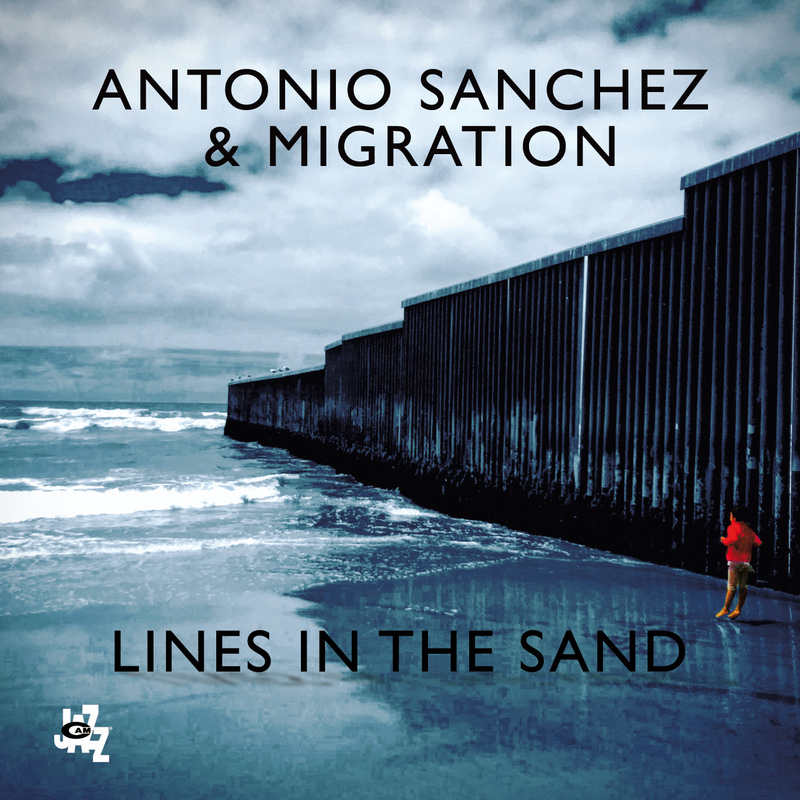 Sanchez is a piano graduated drummer -holding frequently comparisons to another piano player drummer like Jack DeJohnette– and this affects his style in a very spontaneous manner. He draws influences from contemporary jazz, latin, he hits hard even with a cymbal-driven jazz style, or mixes easily his early Rush influences -listen to the Neil Peart influenced sextuplets pattern at around 8 mins in Travesia– with clave or latin derived rhythms. The rhapsodic development of the narration unfolds through the middle tracks in Lines in the Sand: three shorter -if compared to longest suites at start and at the end- pieces that bounce from the calmest to the frenziest. Long Road is a lyrical descending chord progression that enables Methenyesque harmonizations by Thana Alexa‘s voice through an emotional crescendo, while Bad Hombre Y Mujeres is the hardest bounce back. Again the starting riff, a ’70 jazz-rock uptempo bass and fender two notes, is taken directly from the Bad Hombre release, this time from the eponymous track. Then a craziest rollercoaster of polyrthymic insanity and interval leaps by Thana Alexa and Chase Baird play over the highest level of virtuoso unison lines. Matt Brewer, who is moving seamlessly through the whole record from acoustic to electric bass with enviable easyness, and John Escreet sustain a two against three, a sort of hidden clave, while Antonio Sanchez is as usual going back within a net of overloaded polyrhythmicity with no difficulty. This craziness is just interrupted by the punchy bass-driven standard rock of the middle chorus -standard not exactly, as Sanchez still enjoys mixing irregular beats- and then the firing solos interchange between Escreet‘s Fender and Baird‘s electronic EWI. That’s evidently a Cobham-influenced, virtuoso fusion effort at highest octanes, mixed with a sort of prog metal aggressiveness. The tryptic is closed by the intimate and intense ballad Home. Yet another track formerly developed in Bad Hombre, this time added with the lyrics by Thana Alexa. Still chords sustained by piano give a rest to the band, a reflective moment. The rhapsodic text is a tale that navigates the listener through the feeling of progressive transformation, the hope and longing affecting the departure and arrival in a new home to live in. Chords triads seem to move in a weird progression, adding each one over the layer of the previous, like snow on the sand, moving through adjacent modulations, climbing a spiral ladder. Alexa‘s voice delivers an highly emotional and unexpected ballad, playing jazzy caresses and tearing more aggressive nuances. Opened by a ruminative minimalistic piano pattern which seems to go subtly out-of-phase at any moment, Lines in the Sand closing suite is again pervaded by a sense of prolonged development. The initial theme starts after three minutes, again with voice and saxophone playing unison notes moving through shifting beats and scrambling through extended tonal progressions. While the solos by Brewer on electric bass, Alexa and Escreet on electric piano play on a slow tempo, the entire suite is focused on unfolding an intimate emotional narration. It all breaks down with a powerful interruption at around 13 minutes. First the spoken words from the poem ‘At the Wall, US/Mexican border, Texas 2020’ by Paola Gonzalez and Karla Gutierrez, then a driving fast rock pattern paves the road for exhilarating fusion solos by Escreet at Prophet synth reaching one of the peaks of the entire work. The closing is again held by the recitative, this time Jonathan Mendoza repeating his ‘I pledge allegiance’ in the poem ‘Blood Country (after Safia Elhillo)’. Lines in the Sand is an intense contemporary jazz suite, which is eliciting influences coming from Chick Corea’s electric years, PMG group and even progressive rock and melting them in a consistent manner. But it is also an highly emotional work which clearly shows the intent of the author to tell a story. The narration is never a boundary that encapsulates improvisation creativity; if this record is instead about breaking the political walls, it also plays a role in breaking the walls between genre-narrowing labels. Quando nel 2005 il Pat Metheny Group ha pubblicato The Way Up, una monumentale suite di quasi 70 minuti composta da 4 brani che attraversano così tanti generi difficilmente riconducibili solo all’etichetta jazz, è diventato un successo immediato che sarebbe apparso nella maggior parte delle liste del meglio di quell’anno. Riuscendo a toccare uno dei migliori momenti creativi e propulsivi della band, quest’album è un momento di passaggio importante per ridefinire il modo in cui un narratività decisamente poco jazz poteva essere sviluppato da artisti jazz. All’epoca, dal punto di vista personale, mi sentivo come se si fosse creato un ponte tra i miei ascolti jazz e quelli di progressive rock: oggi mi rendo conto di come gli artisti appartenenti ad un’area o all’altra abbraccino questo senso di narratività in maniera diversa. Quella che sarebbe sembrata una montagna difficile da scalare per qualsiasi artista jazz – difficile ad esempio per il rischio di mettere a repentaglio qualsiasi forma di improvvisazione durante la navigazione attraverso complessi di ostinati e contrappunti – non è apparsa, invece, spaventosa per il batterista Antonio Sanchez. L’ormai collega di lunga data di Pat Metheny ha rianimato quella narratività e quello stesso stile di composizione strutturata con la sua band Migration, ora con un’altra registrazione estremamente sviluppata e di considerevole durata, dal titolo Lines in the Sand. Tuttavia, ciò che colpisce di più di questa registrazione, marcando una differenza tra ciò che è avvenuto prima, è la necessità di raccontare una storia contemporanea. La storia sta accadendo ora, la storia è di fronte ai nostri occhi ogni giorno nelle notizie. È la storia degli immigrati che affrontano la disperazione al confine sud degli Stati Uniti. Antonio Sanchez ritorna a quella stessa narratività di The Way Up per raccontare questa storia. Mentre Lines in the Sand viene pubblicato, la storia che racconta si svolge sotto i nostri occhi. La carovana di immigrati centroamericani ha raggiunto il confine americano e cerca di forzare il confine per entrare negli Stati Uniti, respinta con una reazione violenta. I maltrattamenti applicati agli immigrati stanno causando un’agitazione nell’opinione pubblica degli Stati Uniti. Sono orgoglioso di essere un immigrato. Orgoglioso di essere messicano e orgoglioso di essere americano, dice Antonio Sanchez nel booklet del nuovo lavoro pubblicato con la produzione del suo ormai storico collaboratore Ermanno Bassi per CamJazz. Il batterista non fa alcun mistero di quale parte lui stia, dicendo che alzare i confini è un calcolo deplorevole e maliziosamente politico alimentato dal presidente degli Stati Uniti, a cui si oppone pubblicamente fin dalla data della sua elezione. Quando l’avventuroso duo di batteria e samples intitolato Bad Hombre fu pubblicato nel 2017, un Antonio Sanchez arrabbiato ed inquisitivo era raffigurato in copertina su uno sfondo nero. Il riferimento era ai bad hombres, l’appellativo deplorevole con cui il presidente degli Stati Uniti aveva chiamato i messicani. La copertina di Lines in the Sand raffigura una donna vestita di rosso sul lato un muro gigantesco che arriva fino in mare, tenendo i confini ben chiusi. Quello che sembra uno scenario distopico, filtrato dagli effetti speciali nella foto, sta diventando realtà. Antonio Sanchez é stato per lungo tempo in tour negli ultimi tre anni con la sua band Migration: dopo aver pubblicato l’omonimo disco, il gruppo Migration è diventato un progetto a lungo termine. The Meridian Suite, uscito nel 2015 con il nome di Antonio Sanchez & Migration, é stato il primo lavoro ad essere caratterizzato da una lunga suite, invece che singole tracce slegate. In quell’occasione non c’era nessun ospite di lusso, a differenza delle registrazioni passate. Era il segno che il batterista stava dando corpo alla sua visione, una direzione precisa in cui la composizione e l’improvvisazione potevano interagire in questa rete di complessità, ed era pronto a svilupparla con la sua formazione. Sebbene l’improvvisazione non sia in alcun modo secondaria in questo progetto, svolge comunque un ruolo diverso rispetto a qualsiasi altra sessione di jazz. Anche se sviluppato attraverso un quadro molto preciso, ad es. la durata della suite non è maggiore o minore durante la sessione live rispetto al disco, tuttavia contiene una serie non scritta di regole su come ampliare o limitare lo spazio di improvvisazione. La line-up della band Migration è stata abbastanza stabile attraverso le due registrazioni, con il solo Chase Baird al sassofono ed EWI come nuovo membro. La cantante Thana Alexa é il collegamento più evidente con il suono degli anni ’80 del Pat Metheny Group; si muove abilmente tra le linee soliste e contrappone le linee ritmiche, a volte all’unisono con Baird, che a sua volta si concentra principalmente sul lato ritmico. Matt Brewer sta diventando un collaboratore di lunga data di Sanchez e aggiunge sempre una tavolozza di grande estensione alle poliritmie virtuosistiche sviluppate dal batterista. E, infine, John Escreet, uno dei musicisti più sorprendenti e impossibili da decifrare in circolazione. La sua ultima opera da solista Learn to Live mostra con quanta facilità riesce a navigare tra funk, jazz contemporaneo, fusion e così via. Sempre capace di mostrare soluzioni imprevedibili attraverso il suo modo di suonare. Voci di donna si uniscono in un grido di disperazione, sullo sfondo le sirene della polizia, urlano ‘Vergogna!’ durante l’intro di Lines in the Sand, non a caso intitolata Travesia. Il viaggio parte da un tappeto di piano elettrico su un Re armonizzato da voce e basso in maniera sottilmente sfuggente e sospinto dal solito playing intricato di Sanchez. Questo stesso arpeggio di tastiera a loop è il campione principale di Nine Lives, la penultima traccia in Bad Hombre: mantenendo lo stesso spirito implacabile, ballonzolando avanti e indietro tra il guidare il ritmo e la costruzione di un’armonizzazione metrica, ora é l’introduzione perfetta che impone un feel ben preciso per l’intera suite. Ancora quando le tracce si spostano da questo rubato a una parte più costruita e legata al tema principale dopo 3 minuti, l’atmosfera mantiene una sorta di stato riflessivo e ambiguo. Le note di pianoforte liquido di John Escreet si mutano in una serie di triadi ritmicamente complesse (un mix di battute da 4, 2 e 7 quarti) che mette ancora in mostra la voce delicata e precisa di Thana Alexa. La narrazione si svolge con un ritmo lento, non spingendo troppo: l’ascoltatore é davanti a un film, i primi 10 minuti di Travesia hanno una sensazione quasi da colonna sonora, da non scambiare con la più abusata definizione della parola ‘cinematico’. Insomma, la musica non é atmosferica, ma é il suo svolgimento tematico a suggerire una narrazione cinematografica. Non c’è da meravigliarsi se, sopra un pedale modale guidato dal piano acustico, le orchestrazioni di violoncello e viola prendono la scena per suonare un tema dolce e commovente a circa 10 minuti. Fino a quando la traccia non termina in una progressione di accordi che ricorda molto da vicino Pat Metheny e si muove di nuovo sotto un ritmo complesso di battiti. Quando il batterista Antonio Sanchez si é trasferito a New York nel 1993, é diventato ben presto un session-man affermato collaborando con personalità del calibro di Chick Corea, Gary Burton, Michael Brecker, Danilo Perez, oltre a Pat Metheny. Il chitarrista elogia spesso il ruolo chiave del batterista nel suo modo di suonare: Metheny menziona le sue abilità orchestrali come una delle ragioni per cui é membro di così tanti progetti in cui lui stesso é presente. Ovviamente, queste abilità hanno svolto un ruolo chiave nello sviluppo dei progetti dell’ultimo PMG e dei suoi progetti solisti. Tuttavia ha iniziato la sua carriera da solista con Migration, pubblicato con CamJazz, solo nel 2007. Mentre si muove senza intoppi attraverso le collaborazioni di molti dei più affermati musicisti jazz – ad esempio i trio di superstars che suonano in Three Times Three – ora sembra sul punto di spingersi oltre nuovi confini con la sua visione. A seguito della vittoria del grammy per la colonna sonora del film Birdman, ha portato questo lavoro in un interessante tour di batteria più film e poi ha esplorato il solo batteria ancora con il menzionato Bad Hombre. Poi si é rivolto anche alla parte opposta dello spettro per un’opera orchestrale. All’inizio di quest’anno ha pubblicato Channels of Energy insieme a Vince Mendoza e alla WDR Big Band, mettendo la complessa architettura delle sue tracce ancora più a rischio, come un trapezista sulla corda, in uno’opera energetica e poderosa. Mentre Lines in the Sand è ancora caratterizzato da questa stessa cifra orchestrale, la differenza rispetto al precedente lavoro di quest’anno sta nel modo in cui sviluppa un senso di narratività attraverso la sua scrittura. Sanchez è un batterista diplomato al pianoforte, spesso paragonato con un altro batterista e pianista come Jack DeJohnette, e questo influenza il suo stile in modo molto spontaneo. Trae ispirazione dal jazz contemporaneo, dal latin, colpisce in maniera incisiva sui piatti anche quando suona jazz, o mescola facilmente le sue influenze, come ad esempio i Rush -da sentire il pattern di sestine ispirato a Neil Peart a circa 8 minuti in Travesia-, con clave o ritmi derivati ​​dal latin. Lo sviluppo narrativo si snoda attraverso le tracce intermedie di Lines in the Sand: tre più corte rispetto alle suite più lunghe piazzate in apertura e chiusura, che rimbalzano dallo stato più calmo al più frenetico. Long Road è una progressione di accordi discendente caratterizzata da un’atmosfera lirica che consente armonizzazioni a la Metheny della voce di Thana Alexa attraverso un crescendo emotivo, mentre Bad Hombre Y Mujeres è l’esatto opposto. Anche in questo caso il riff di inizio, un uptempo da jazz rock anni ’70 portato da basso e Fender Rhodes, viene preso direttamente da Bad Hombre, questa volta dal brano che da il nome all’album. Quindi le montagne russe più folli, poliritmie e salti di intervalli impossibili che Thana Alexa e Chase Baird giocano sul più alto livello di linee di unisono virtuosistiche. Matt Brewer, che si muove nell’intero disco dal basso acustico a quello elettrico con invidiabile facilità, e John Escreet sostengono un ritmo di due su tre, una sorta di clave nascosto, mentre Antonio Sanchez va su e giù all’interno di una rete poliritmica senza apparente difficoltà. Questa follia è interrotta dal chorus, uno standard rock con un basso pulsante, ingannato da Sanchez attraverso multipli battiti irregolari, e poi gli scambi di assolo tra il Fender di Escreet e l’EWI di Baird. Un picco di fusion virtuosistica ad altissima difficoltà, dove é evidente l’influenza di Cobham, mescolata con una sorta di aggressività da prog metal. Il trittico è chiuso dalla intensa ballad Home. Ancora un’altra traccia precedentemente sviluppata da Bad Hombre, questa volta con l’aggiunta dei testi di Thana Alexa. Gli accordi lasciati risuonare dal piano elettrico danno un po ‘di riposo alla band, un momento riflessivo. Il testo è una storia che fa navigare l’ascoltatore attraverso il sentimento di una trasformazione progressiva, la speranza e il desiderio che influenzano la partenza e l’arrivo in una nuova casa in cui vivere. Le triadi di accordi sembrano muoversi in una strana progressione, aggiungendosi ciascuna sopra lo strato del precedente, come la neve sulla sabbia, passando attraverso modulazioni adiacenti, salendo in una scala a spirale. La voce di Alexa da la sensazione di una ballata molto emozionante e inaspettata, giocando con carezze jazz e strappando sfumature più aggressive. Aperto da un pattern ruminante di pianoforte minimalista, che sembra andare sottilmente sfasato da un momento all’altro, la suite Lines in the Sand è nuovamente pervasa da un senso di sviluppo prolungato. Il tema iniziale inizia dopo tre minuti, di nuovo con la voce e il sassofono che suonano le note all’unisono, che si muovono attraverso ritmi mutevoli e si arrampicano attraverso le progressioni tonali prolungate del brano. Mentre gli assoli di Brewer al basso elettrico, Alexa ed Escreet al piano elettrico articolano un tempo lento, l’intera suite è incentrata sullo svolgimento di una narrazione emotiva intima. Tutto si rompe con una potente interruzione a circa 13 minuti. Prima le parole in parlato dal poema ‘At the Wall, US/Mexican border, Texas 2020’ di Paola Gonzalez e Karla Gutierrez, poi un rock veloce che apre la strada ad esaltanti assoli di fusion di Escreet al Prophet synth, capace di aggiungere uno dei momenti più intensi dell’intero lavoro. La chiusura è di nuovo rappresentata dal recitativo, questa volta da Jonathan Mendoza che ripete il suo “dichiaro fedeltà a” nel poema ‘Blood Country (afterSafia Elhillo)’. Lines in the Sand è un’intensa suite jazz contemporanea, che non nasconde influenze provenienti dagli anni elettrici di Chick Corea, dal PMG e persino dal progressive rock e li mescola in modo coerente. Ma è anche un lavoro altamente emotivo che mostra chiaramente l’intento dell’autore di raccontare una storia. La narrazione non è mai un limite che incapsula la creatività dell’improvvisazione; se questo disco parla, invece, del rompere le mura indicate della politica, gioca anche un ruolo nel rompere i muri tra le etichette dei generi musicali.